Lorl pulled an aged tome out of the rubble and shook it free of dust. Might as well take it, he thought. Some inner city noble might pay a decent price for it. It used to be easy to find artefacts amongst the ancient ruins. They called it the Age of Abundance, when most of the citystates got their Wonders. Although, scavenging was a dangerous business in those times. Of course there were still plenty of unexplored ruins to the south, but Lorl was content with the meagre offerings and relative safety of the ruins close to home. Selling metal scrap and the occasional trinket provided him with enough income to live comfortably. A hole which is longer on the inside than the outside. Tests shows that subjects thrown down the well are found both dead at the bottom while simultaneously still falling. subjects climbing up are both climbing and simultaneously emerging and [data expunged]'ing. Underground bunker in the uk, leads down to a chamber, former Royal Observer Corps outpost. Hatch, air vent and orlit (built by Messrs Orlit Ltd)? giant floating living creature like in look to windward. Special Containment Procedures: Each manifestation of SCP-1878 should be neutralised by the timely execution of procedure B-04 "Milkround" by assigned operatives. In general an instance of SCP-1878 will appear daily. Procedure B-04 is performed as follows. At 0445 hrs, assigned operatives must ensure that a Foundation-operated truck (LGV) is in place at the intersection between Alberts Rd. and Downsfield Rd. The truck must block the road entirely. At 0500 hrs, SCP-1878 should attempt to turn onto Alberts Rd. from Downsfield Rd. If the truck is positioned correctly SCP-1878 will be unable to continue and will halt. After SCP-1878 has stopped, it should be disabled by disconnection of its battery located underneath the payload platform of the vehicle. At approximately 0505 hrs, SCP-1878 and its contents should be loaded into the truck and taken immediately to Site-52 for incineration unless otherwise instructed. Any deviation from the expected behaviour or contents of SCP-1878 should be reported to Dr. Clarke (see addendum). 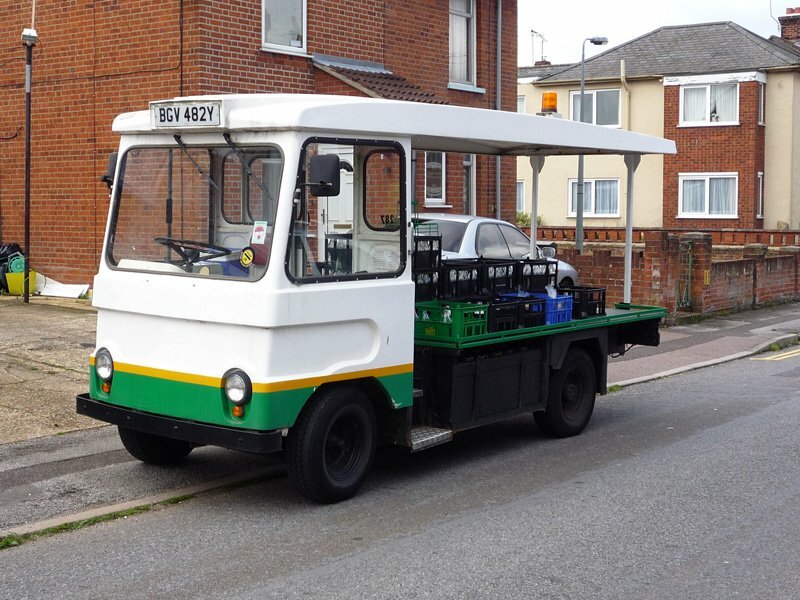 Description: Instances of SCP-1878 outwardly appear to be standard unmarked milk floats (a battery-operated platform truck). Associated with each instance of SCP-1878 is its humanoid driver (designated SCP-1878-1) and its payload of a milk-like substance (designated SCP-1878-2). Despite extensive surveys of the area around Alberts Rd. (located in █████, England), the point of origin of SCP-1878 has yet to be determined. SCP-1878's steering wheel is non-functional, and it does not possess pedals or an instrument panel. However, it has only been observed to move when SCP-1878-1 is in the driver's seat. It is unclear whether the vehicle is capable of autonomous movement. SCP-1878's wheels are powered by a single battery connected to electric motors. SCP-1878-1 is an entity which appears to be a human male approximately 40 to 50 years in age. While SCP-1878-1 is externally indistinguishable from a normal human, its internal anatomy and genetics seem to be significantly simpler (further details available in medical report 1878-A). In general, instances of SCP-1878-1 do not display signs of intelligence and do not respond to external stimuli - with some exceptions. When seated in SCP-1878, SCP-1878-1 remains mostly static and faces directly ahead. SCP-1878-2 is a substance similar to milk in appearance and viscosity. When being transported by SCP-1878 it is always stored in unmarked glass bottles with aluminium foil lids. While SCP-1878-2 usually contains lipids and polypeptides (these often include non-standard amino acids), they are unlike those found in milk from any known animal. Consumption of the liquid is described as unpleasant but is generally not dangerous for most individuals; the results of experiments into the effects of long-term consumption are summarised in addendum 1878-B. The exact composition of SCP-1878-2 changes on a regular basis. If an instance of SCP-1878 is not neutralised it will proceed to deliver SCP-1878-2 to all houses along Alberts Rd. (located in █████, England) occupied by a family with at least one child under the age of twelve (17 households as of ██-██-████). One bottle of SCP-1878-2 will be placed outside the door for each current occupant of each house. SCP-1878 drives between houses, and SCP-1878-1 physically delivers SCP-1878-2 to the doorstep of a given household (this is generally the only time SCP-1878-1 is observed to move). SCP-1878-1 will also collect and return to the vehicle all emptied milk bottles left outside the door of any households it visits. The following is an abridged list of significant deviations from normal behaviour and contents of SCP-1878 with associated date. ██-██-1991: Failure of procedure B-04. SCP-1878-2 was delivered to 22 households, of the 18 individuals who ingested SCP-1878-2, 14 reported stomach complaints and 1 was hospitalised with severe diarrhoea. ██-██-1995: SCP-1878 did not manifest for 13 days. ██-██-1995: SCP-1878 stopped in front of the Foundation truck used for procedure B-04, paused for several seconds and reversed a distance of approximately one metre. ██-██-2002: SCP-1878 arrived without its payload of SCP-1878-2. ██-██-2005: SCP-1878 crashed into the Foundation truck used for procedure B-04, damaging itself. ██-██-2005: SCP-1878 did not manifest for 3 days; when it next arrived, its payload of SCP-1878-2 appeared to have spoiled. ██-██-2007: All samples of SCP-1878-2 tested were found to be heavily contaminated with unknown unicellular organisms. Testing is ongoing. ██-██-2008: SCP-1878 did not manifest for 17 days. ██-██-2008: SCP-1878-1 turned to face operative █████ when it was approached and maintained eye contact for the duration of procedure B-04. ██-██-2009: Failure of procedure B-04. SCP-1878-2 was delivered to 16 households, none of the 12 individuals who ingested SCP-1878-2 reported any ill-effects. ██-██-2011: SCP-1878-1 turned to face operative ████████ and vocalised when it was approached as part of procedure B-04. Its vocalisations were unintelligible. The following is a summary of the three SCP-1878-2 long-term exposure experiments performed in the period between 1999 and 2006. Subjects: 12 D-class personnel aged 20-30. Results: Subjects were instructed to consume one bottle of SCP-1878-2 daily for a period of one year. No adverse long-term effects evident. Subjects: 212 D-class personnel aged 20-30, control group of 344 D-class personnel aged 20-30. Results: Test subjects were instructed to consume one bottle of SCP-1878-2 daily for a period of three years, members of the control group were instructed to consume one bottle of normal cows milk for the same period. Compared to the control group there was a small but statisically significant increase in the development of schizophrenia-like psychoses amongst those in the test group. While there is some qualitative evidence that SCP-1878-2 can lead to altered emotional states it is inconclusive and conflicting, further testing is required to establish any causality. Subjects: 43 individuals aged 12 and under.